The 30% price rise in first-class stamps, and 39% rise for second-class, mark the biggest annual increase in percentage terms since 1975. Ten years ago, a first-class stamp cost 27p, and a second-class cost 19p. 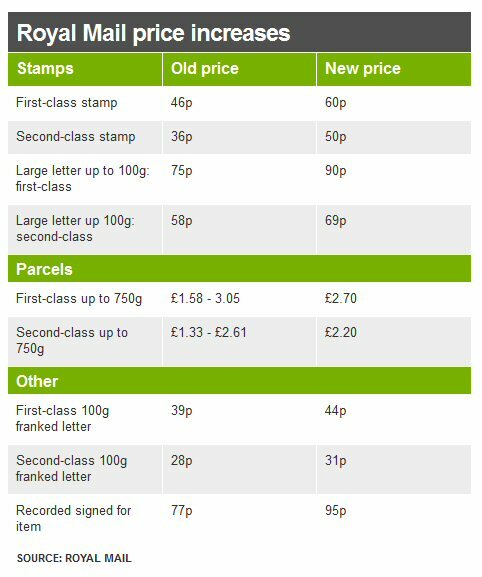 Over the next seven years, the price of second-class stamps will be capped at 55p but this limit could rise with inflation each year. With the price of stamps increasing now would be a better time than ever to start looking into alternative channels for communicating. We say why not reduce your postal and printing costs by communicating via SMS? Using SMS won’t just reduce costs it will also increase the likelihood of your message being read. According to ABI Research over 99% of all texts are read by the recipient – you can’t expect that kind of figure from sending out a leaflet in the post. Furthermore, using our portal you can measure the effectiveness of sending out texts as you get statistics for each campaign you send, meaning you can track which messages are effectively engaging with the recipient, which have been read and which numbers have failed. All in all using SMS is a quick, direct method of communicating which helps you engage with customers whilst reducing costs. Contact us today if you want to know more about our online SMileS SMS portal; we can discuss pricing, examples of when you could use the portal to replace sending out post and we can even give you a demo of the system. Posted on March 30, 2012, in Market Industry and tagged BBC, Business Mail, Royal Mail, SMS, SMS Marketing, Stamps, Text Marketing. Bookmark the permalink. Leave a comment.